See You at This Year’s Conference! Just a reminder: the early bird rate for this year’s NAIA Conference won’t last much longer. Sign up today! As always, this will be a fascinating and inspiring event for all animal lovers with unforgettable, world-class presentations from experts. There will also be a strong focus on workshops to help you make a difference in your community with the knowledge you have gained! John Simpson and Michelle Pardo, Attorneys at Law and Partners, Norton Rose Fulbright, Washington, DC: Insights gained along the way to the landmark $25 million settlement paid by HSUS and the ASPCA to Feld Entertainment. Cynthia O’Connor, DVM, Chris Walker, AKC VP of Communications, Patti Strand, NAIA President: The anatomy of a TV hit piece: HBO’s Unnatural Selection. Janice Aria, Director of Animal Stewardship, Ringling Brothers Center for Elephant Conservation: Animal care at the Greatest Show on Earth, perception vs. reality. When trying to understand the animal rights mindset, and why they are never satisfied with improvement in animal care and welfare, it is important to remember the above quote. Because it has never been about humans taking better care of the animals they keep, it is about humans not keeping animals for any reason whatsoever. 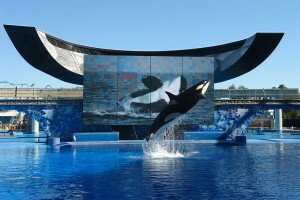 But the idea that they are trying to appease animal rights advocates misses the point. Animal welfare is not about appeasing ideologues and extremists who will never be happy with you. If that is what you make it about, you’re doing it wrong: the only form of appeasement that works with them is not to keep any animals at all. Animal welfare is about making sure the animals you care for are not hungry, thirsty, or afraid. It is about providing comfort and preventing pain and injury. And (as in this case) it is about providing an ever-improving environment for them. Animal welfare is for people who actually care about animals. These are the kind of things normal people care about, and these are the standards being addressed by SeaWorld. NAIA at the National Conference of State Legislatures! The NAIA booth is set up and ready for action at the National Conference of State Legislatures in Minneapolis, Minnesota! 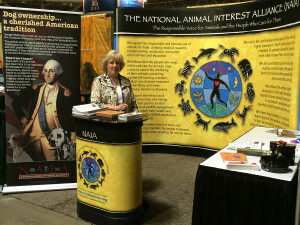 Stop by the booth and say hi to NAIA Board Members Patte Klecan and Caren Cowan! The USDA’s new health requirements for dogs properly limits dogs from being imported into the US from foreign countries and territories for resale. These dogs, which are often sold from the back of vans in parking lots and adopted from rescue groups often come from parts of the world where humane standards are non existent, and where diseases and parasites eliminated in this country long ago are still prevalent. Many dog traffickers will figure out a way around this law (thousands are being smuggled across the Mexican border into the US each year) but at minimum it will serve as a warning to the people who now peddle these dogs to an unwitting public. This is big news and we are thrilled at NAIA. Imported dogs pose serious health threats to US animals and people, and we have long supported reasonable import regulations and enforcement as part of a solution. Note: this will not affect the ability of individuals to import dogs for their own use; this affects only dogs brought into the United States for resale. NAIA conference information: Those who aren’t at the table are on the table! 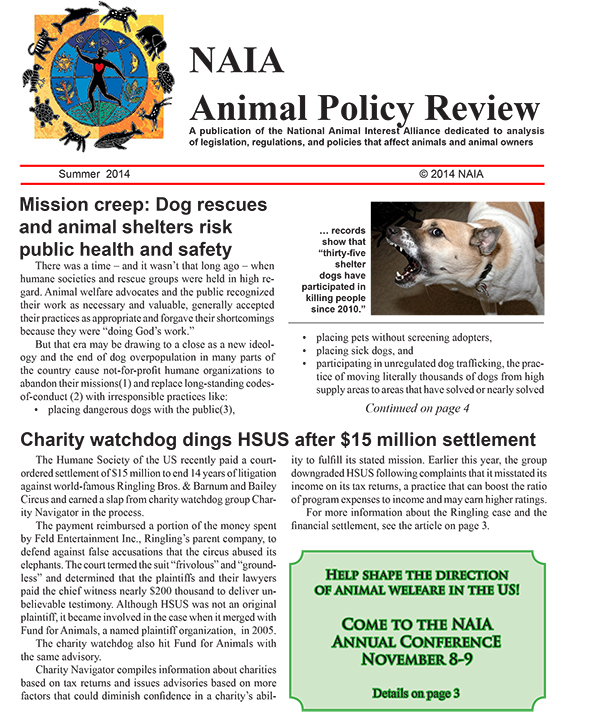 Recent dog attacks, one that left a jogger dead and a second that resulted in a child being mauled by three dogs highlight issues that we have been studying for a long time: enforcement of animal control laws, and rescue gone wild. But as the woman who sued for being bitten in 2012 pointed out, the owners still have not even put up a fence around the yard, as was stipulated in her lawsuit. Had the owner been forced to comply with just that one small measure, we wouldn’t be talking about this story today. If it is true that animal control knew the dog was vicious, but still released it to the rescue, we must take a moment to weep for the death of common sense. Do incidents like these need to become commonplace before something is actually done?